The Royal Mail say that the subscription market is booming, with one in four of us (27pc) are signed up to receive something; food, flowers, booze etc. Previously this was primarily a magazine subscription. Yes Response has just secured a new subscription fulfilment project for an artisan food and drinks brand. We have been tasked with printing the branded postal packaging, collation and monthly mailing to their database. The first monthly subscription box will land in the first days of March. A start up subscription based craft gin business gave the following advice to Daily Telegraph readers; for those starting out, outsource your logistics so “your business can easily scale from day one and you can focus on building your brand, not packing”. Let Yes Response remove your subscription fulfilment headaches, enabling you to focus on the key aspects of building your business. Jennifer (Jen) Davies has joined our mailing team. Jen was previously employed by a local printing company for 32 years until there closure in December. 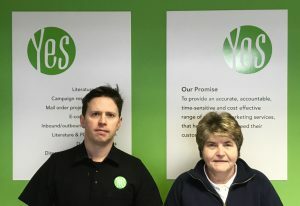 Jen will bring new skills to Yes Response with our planned investment in additional laser printing and print finishing equipment in the next four months, in response to the ever increasing demand from clients for our time sensitive print personalisation and mailing services. 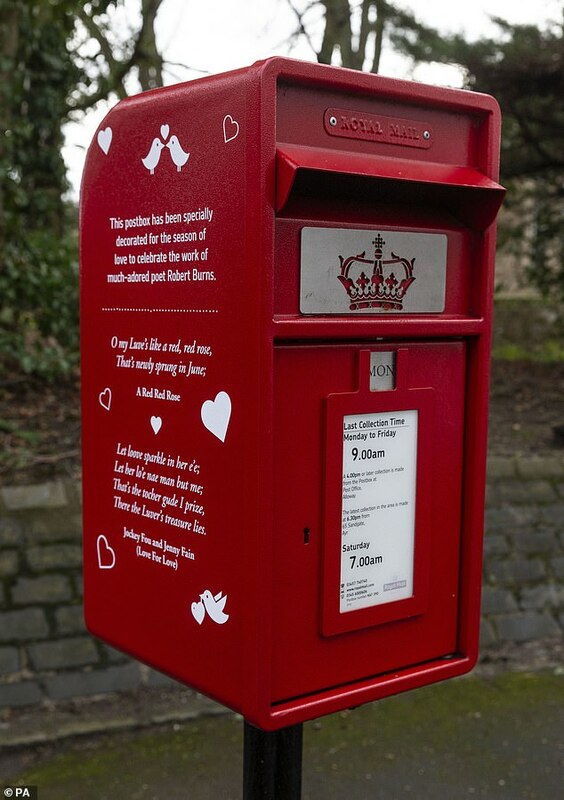 Royal Mail are celebrating Valentine’s Day this week by giving post boxes a makeover, using the words of some of history’s great romantic writers. Romantic quotations from works by John Keats, Robert Burns, Anna Seaward and Thomas Hardy will adorn a post box in their respective birthplace ; Hampstead Heath -London, Alloway -Ayr, Lichfield –Staffordshire (the closest proximity to Yes Response) and Higher Bockhampton- Dorset. In 2012 more than 100 post boxes were repainted gold to honour the birthplaces of Olympic and Paralympics gold medal winners from the London Olympics . This was the first time the post boxes had changed colour from the traditional red. Yes Response provides a time sensitive and cost effective service for both large and or small but complex mailings; taking advantage of our significantly discounted postage rates. Yes Response would like to wish all our clients, business partners, suppliers and advisers a very Happy Christmas and a Profitable New Year!